There is growing support for the idea that incarceration is not simply a matter of crime and punishment, but also an issue of public health. 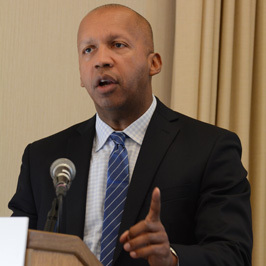 In one of the first opportunities to collectively explore this perspective, leaders from more than 50 public health schools gathered for “A Public Health Approach to Incarceration: Opportunities for Action,” a two-day conference organized by the Mailman School and the Tow Foundation, which also provided financial support. “Public health, incarceration, and justice issues are inextricably linked, in both the causes of the incarceration rate, and in the solutions we need to put together,” said Dean Linda P. Fried. Over three million Americans are incarcerated, more than anywhere else in the world, with rates sharply up despite a decline in crime. Six million Americans are on probation or parole, and a staggering 68 million have criminal records that they may be required to report on a job application. Welfare reform in the 1990s barred Americans with drug records from getting food stamps, public housing, and from some basic healthcare systems. This had “collateral consequences,” Stevenson said, creating a class of “new untouchables”—mainly women and children—that struggles with disease and deprivation. A narrative of fear about “superpredator” children propegated in the 1990s led to a sharp increase in the number of juveniles tried as adults. Today, a quarter of a million adults are in prison for crimes they committed as children, and 3,000 of them have been condemned to die in prison. Another result of the drug war and “tough on crime” policies is the neglect of prisoner health. As a result, rates of drug-resistant tuberculosis, MRSA, and scabies are on the rise, and nearly 50% of prisoners have a diagnosable mental health disorder. Stevenson offered four ideas for effecting change: get closer to communities to learn from them; stay hopeful; commit to work within difficult and uncomfortable realities; and shift the narrative away from fear and punishment. Changing the conversation was also the theme of a panel co-led by Emily Tow Jackson, executive director of the Tow Foundation, and Bill Keller, the former editor of the New York Times and current editor of the Marshall Project—a nascent news outlet devoted to covering criminal justice issues. To make the problem of incarceration resonate with media and broader public, they agreed, it is important to make it relatable. Instead of humanitarian concern for prisoners, Americans relate to the costs of imprisonment (one year at San Quentin costs more than tuition at Stanford) and safety concerns stemming from the failure to rehabilitate prisoners. These notions are already gaining ground in conservative circles, noted Keller. Other panels explored issues from the schools-to-prisons pipeline and the rights of the formerly incarcerated to the roles of education, research, and advocacy in bringing about change. “My dream is that this event will catalyze a new conversation among professionals and students and inspire action to address mass incarceration in the United States as a public health crisis,” said Emily Tow Jackson. The conference was part of a seminar series and scholarly focus at the Mailman School. A number of faculty research and teach incarceration issues, including Robert Fullilove, EdD, professor of Sociomedical Sciences, and Amanda Geller, PhD, assistant professor of Sociomedical Sciences—both of whom led panel discussions at the conference. What is the public health lens on incarceration in the United States? How can schools of public health impact, quicken, and inform public policy change?What information do policy makers need, and in what form? What kinds of advocacy are public health students involved with to address issues of incarceration in the U.S.? What kinds of work are public health alumni undertaking? schools to have an impact on research, education, practice, and policy? How can our partnerships be more innovative? What are the most important research questions for public health to address incarceration issues? How can we push the envelope with our research agenda? into the Media How can public health schools engage with the media and become more active in the public debate on incarceration and criminal justice policy? What should every public health school be doing to address the issue of incarceration in the United States? What are the most innovative strategies currently implemented?